Whether your looking for a short afternoon ride, or multi-day trip, the scenic highways radiating from Mammoth Lakes provide enough touring miles to keep even the most traveled motorcycle tourer happy for a lifetime. Take a ride on the wild side! Why spend thousands when you can rent one of our top quality name brand motorcycles? Feel the air on your face. Eaglerider Motorcycle Rentals offers exciting motorcycle tours and rentals. Also rent watercrafts, ATVs, scooters, snowmobiles and more! Veteran motorcycle touring business located in Camino, CA. Over 18,000 miles of guided tours provided in 2010 alone. 3, 4 and 12 day rides. Summer is the best time for motorcycle touring in the Eastern Sierras. 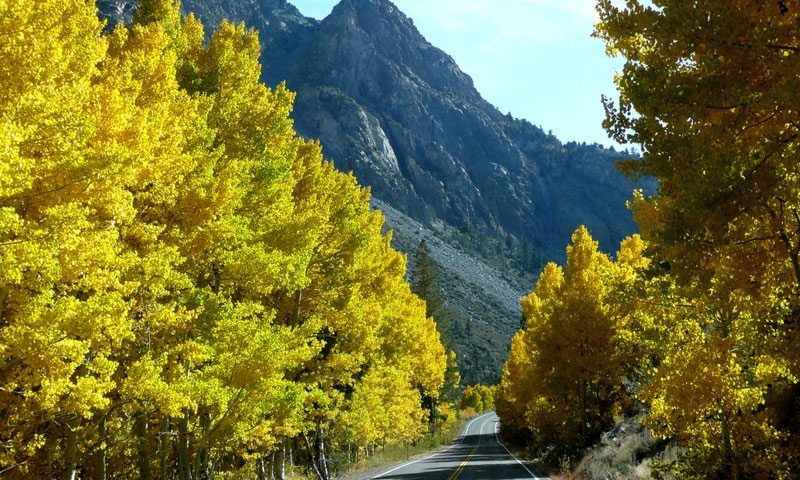 For a great tour of the Sierras, tackle the 250 mile Eastern Sierra Scenic By-Way. For a shorter outing, drive the fourteen mile loop around June Lakes. For access to locals only information, hire one of the qualified guide services found on this page. Nestled in the heart of the Inyo National Forest, Mammoth Lakes is home to some of the most breathtaking scenery in the world, so virtually any direction you head on your bike will treat you to beautiful scenery. Whether you’re looking for a quick afternoon outing, or a multi-day bike tour, Mammoth Lakes is the perfect jumping off point for all your eastern sierra bike touring. Summer is the best time for motorcycle touring in the Sierras as winter ushers in cold temperatures and heavy snows. This fourteen mile loop, located twenty minutes north of Mammoth Lakes includes views of four scenic lakes, towering mountains, and breathtaking alpine scenery. You can complete the drive in about half an hour, but we recommend taking it slowly. The area lakes boast abundant trout fishing, and the city of June Lake has several quaint eateries and shops. Stretching 250 miles between Topaz Lake in the North and Little Lake in the south, this scenic by-way boasts 23 scenic turn-outs and interpretive displays, all easily found by looking for the labeled turnouts. Along the route you’ll pass famous attractions such as Mono Lake and Lake Crowley. This 50 stretch of highway treats visitors to some of the most spectacular scenery in the park. If you’re short on time, drive straight through in one hour. If not, spend the day. Along the way, stop at Grant’s Grove for a chance to see the General Grant Tree, one of the largest in the world, measuring over 250 feet tall. Additional sites include sweeping canyon views and an opportunity to stop at Boyden Caverns. Rentals are available at several locations around town. Looking for the ride of your lifetime? Explore the professional guide services on this page. They can plan anything from an afternoon outing to a multi-day trip.